Friday was the day in Ensenada, Mexico. I was very hesitant to get off the boat mostly because I did not want to deal with the millions of street vendors selling stuff I don’t want in my face. Let’s just say when we went to the Bahamas I was very frustrated. The boat pulls up next to the dock and you pay $2 to get into town. I finally agreed after walking around all morning I would go in to see the town then come back. Interesting thing–when we got into town we noticed the price of the “blowhole” tour (goes to a natural blowhole about 45 minutes away) was down $5 than on the ship. We were excited about this so we got on the bus and road over to the site. Not only did I enjoy our tour guide trying to explain the interesting stuff to the bus as well as avoid one couple’s inquiries about the “dodgy” side of mexico (drug cartel, violence, etc.) but he walked us down the main strip near the blowhole and showed us where to eat. This was nice because on our way back, he was pretty much at every place we stopped at eating the same food we were. I figured this was a safe bet if he was eating the stuff…including the amazing tasting fish tacos. 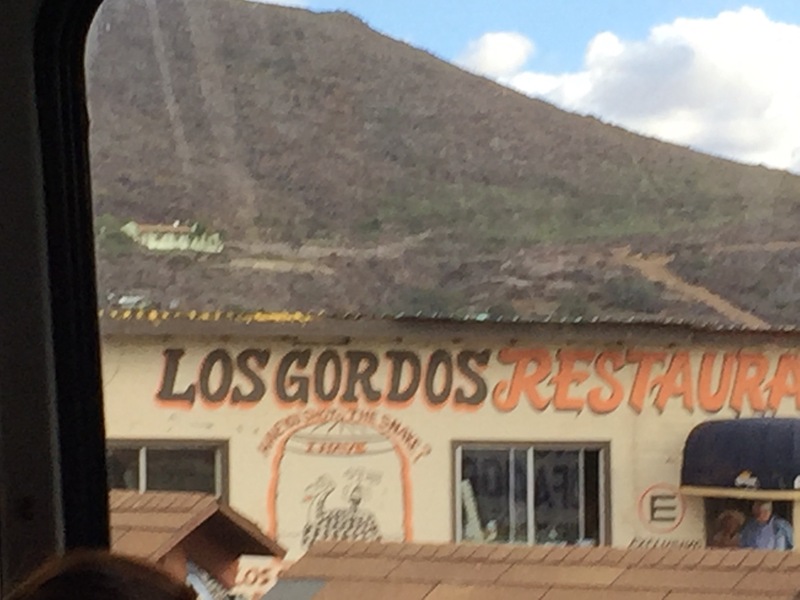 This place “Los Gordos” was an interesting little restaurant. While we did not eat there, there is an exhibit where you can taste tequila that was sitting in a jar with a rattlesnake in it. I guess the snake is dead — but its a nice tourist trap for photos. One person on our boat went to check it out and made us about 1/2 hour late because they were in line. 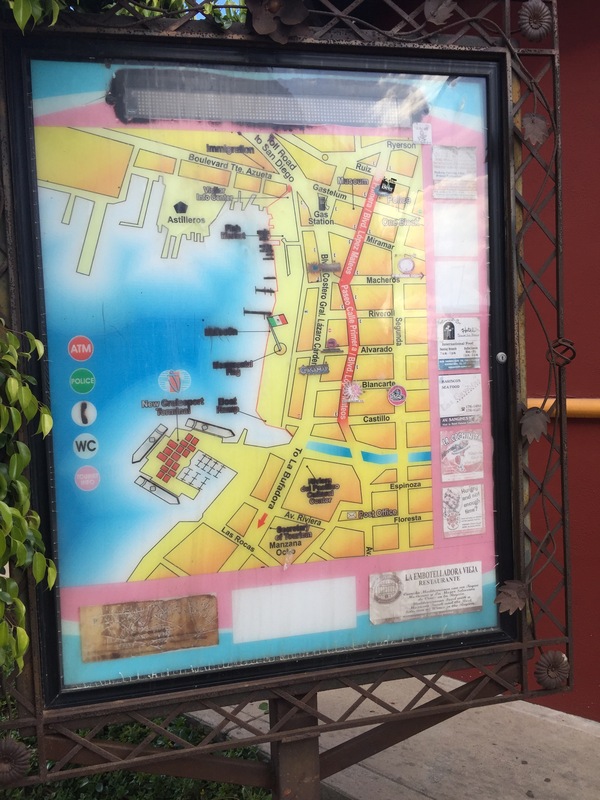 I’m glad we stayed with our tour guide and bus driver at the taco place… worth knowing if you’re getting back to the boat or not. Below is a picture of some of the wonder food we had. 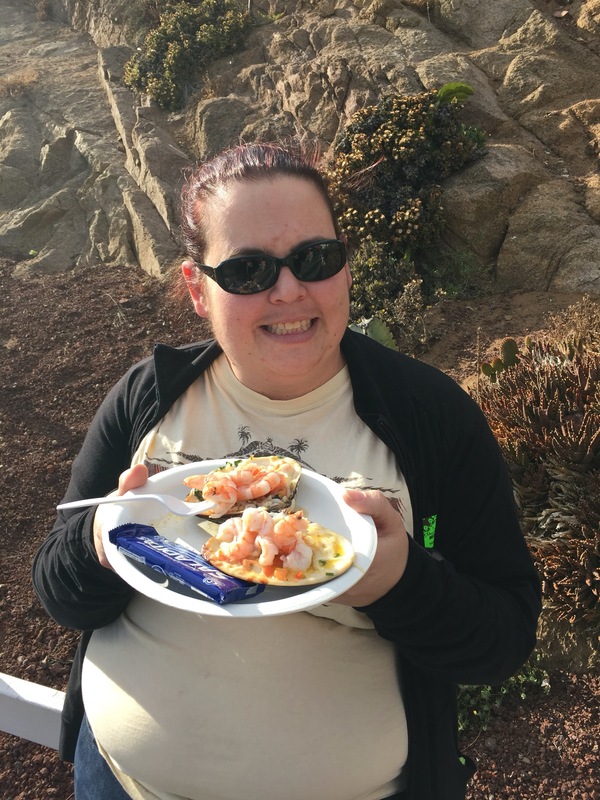 It was clam and shrimp cooked on a grill with a bed of cheese on it. Too tasty. Grant it I only have 4 bits cause I wasn’t feeling the greatest–but it was still good for $7. Normally something like this in the states is over $10 by itself. Off the boat excursions/trips are usually cheaper than if you book on the ship, but I like to do it through the cruise line just because I feel more safe, secure and also the guarantee that they’ll get you back to the boat on time. And the cruise line is putting their reputation on the line if they offer you a bad excursion, otherwise you’re on your own. Glad you enjoyed it though and go back to the ship on time!